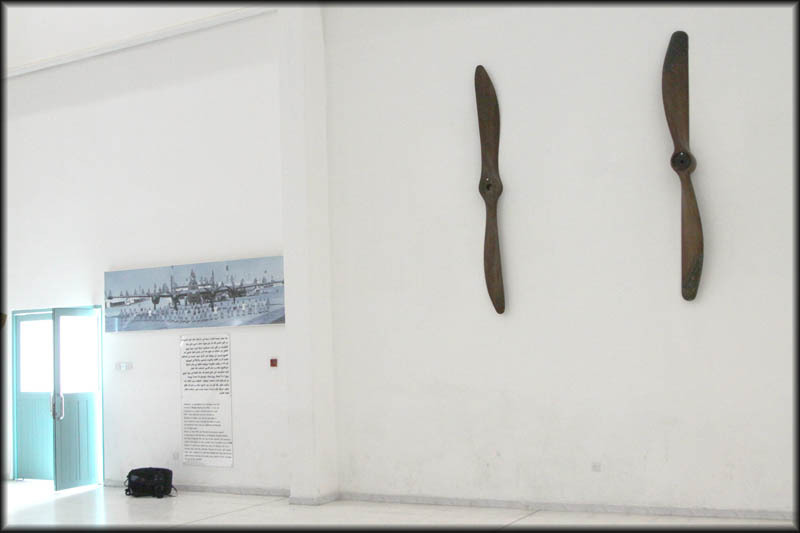 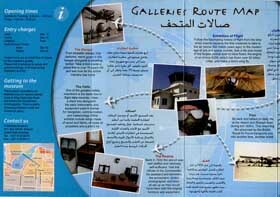 A quick trip to Sharjah 15-17 February brought me in a position to visit the aviation museum in Sharjah City. 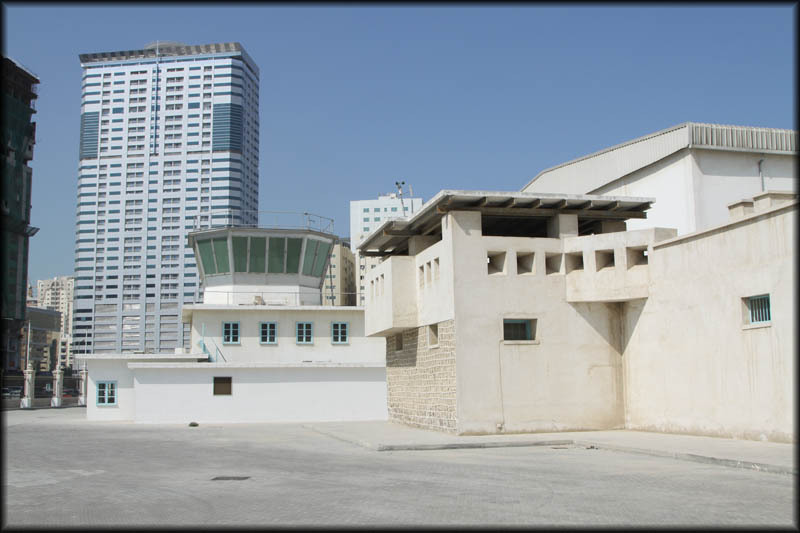 Planes landed at what is now the busy King Abdul Aziz Street and one slept in 'the Fort', which is where the museum is located. Al Mahatta museum, with the ATC Tower and the hangar, which has the aircraft on display inside. 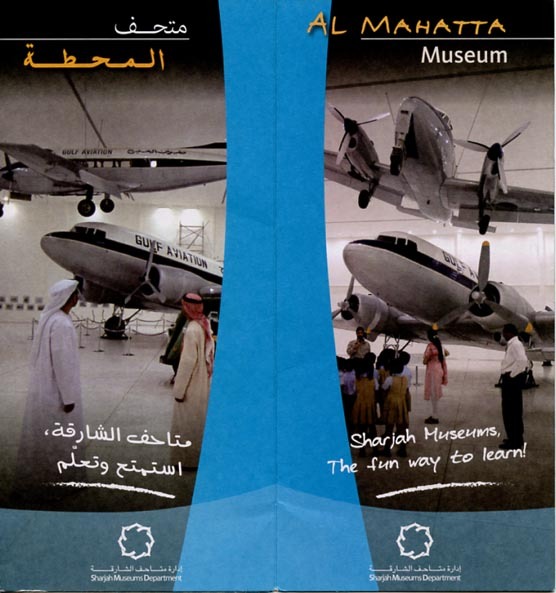 Al Mahatta museum is right in the city, towering 'skyscrapers' surround this nice museum. 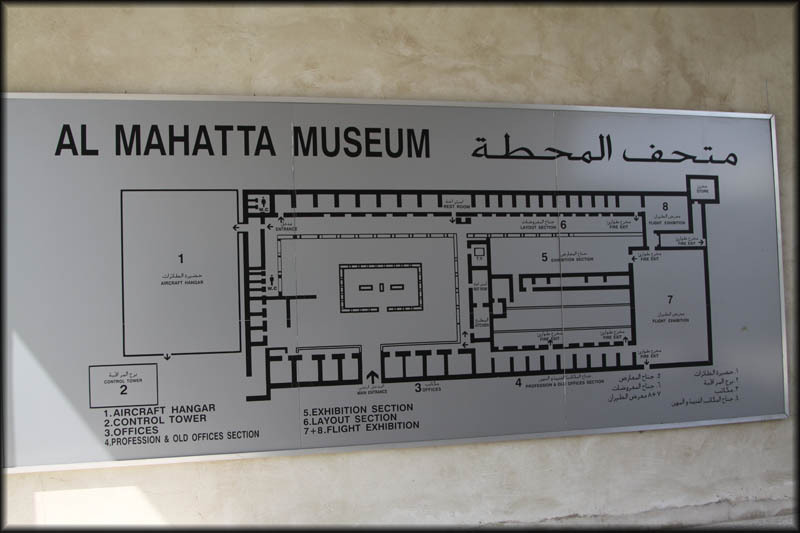 Lay out of the entire museum. 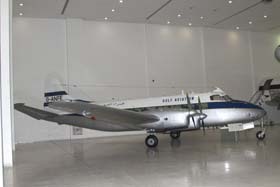 Hall 1 has the aircraft on display. 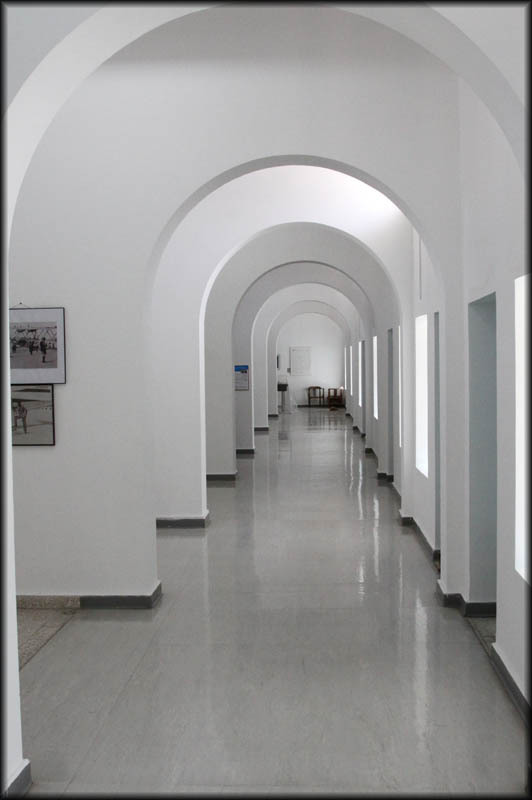 Don't skip the film in the Mess Hall ! 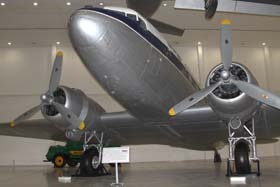 Douglas C-47 G-AMZZ has pride of place, in the center of Hall 1. 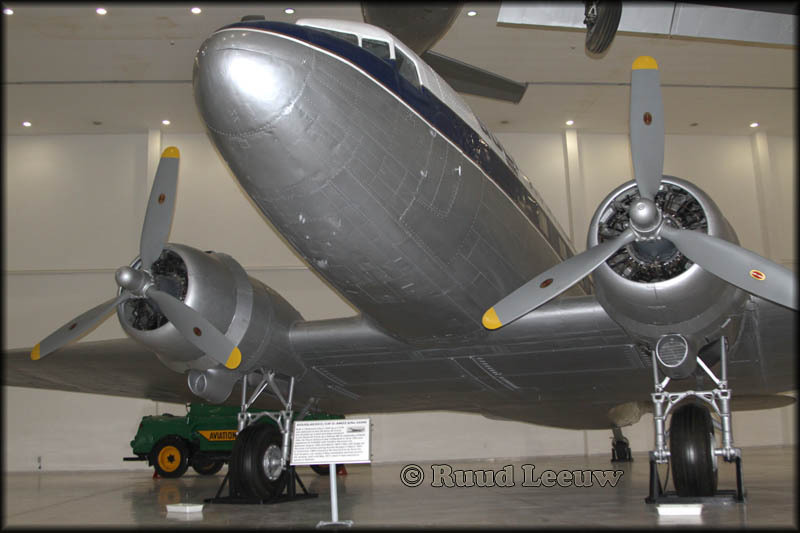 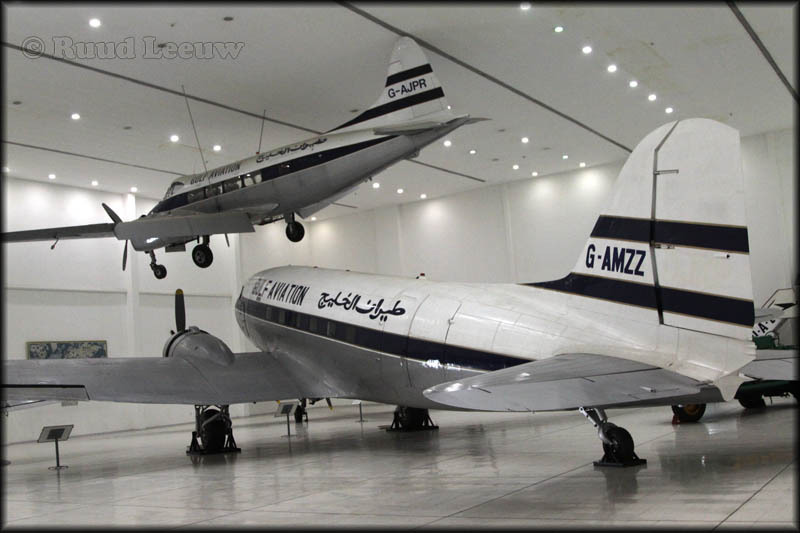 DC-3 G-AMZZ here has its identity in question! 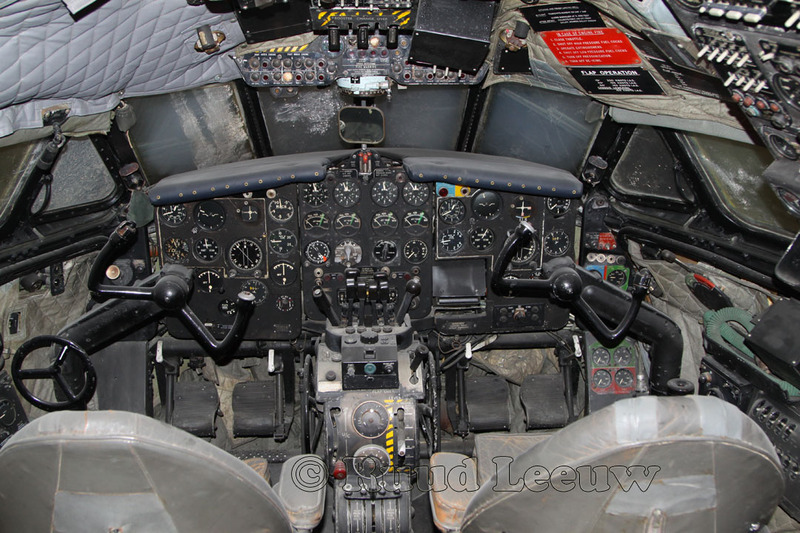 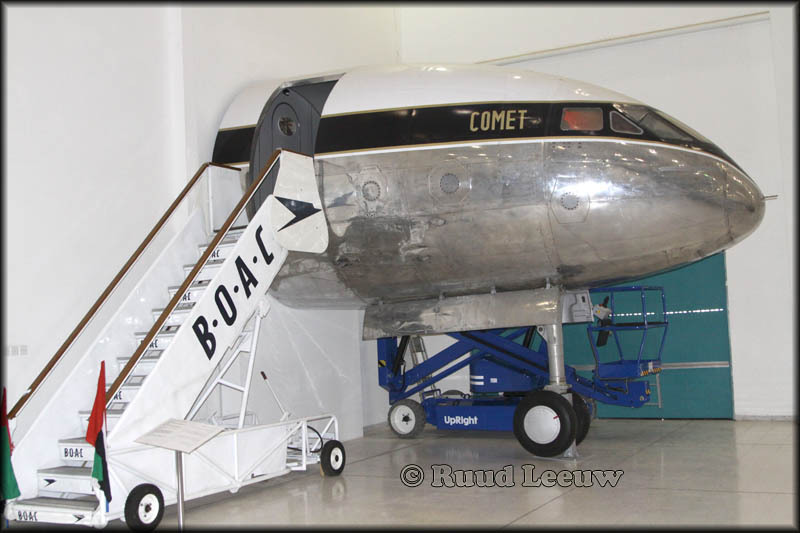 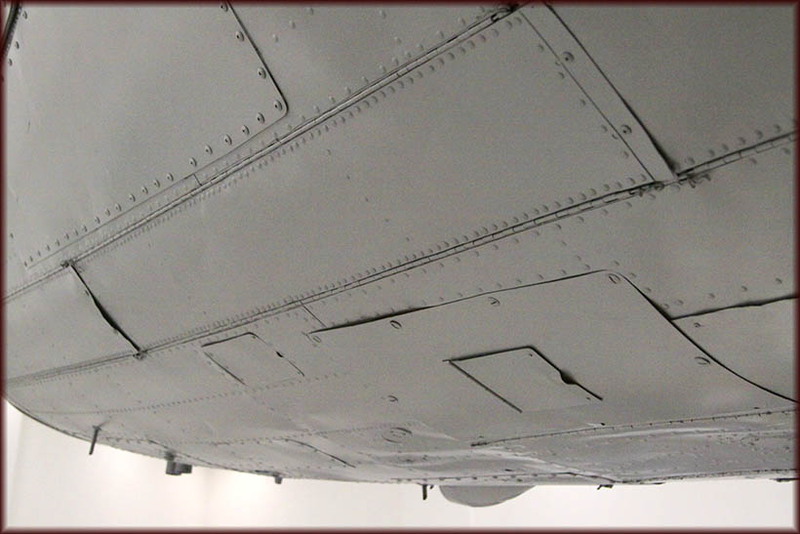 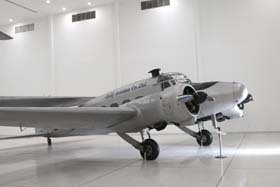 The museum has it on display as c/n 33340, but that one has also been reported as preserved in Kuwait... 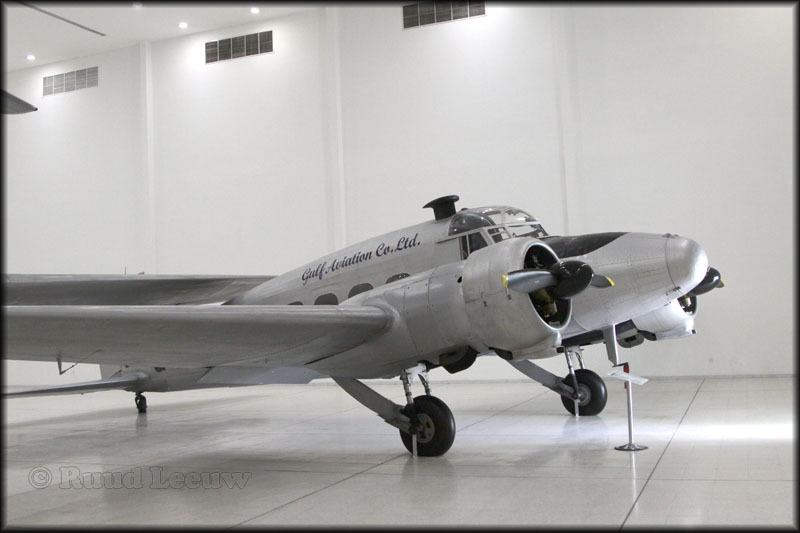 This one would be or could be c/n 12449, as RCAF KG559(?) 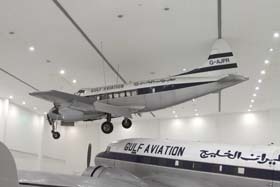 delivered to the Indian Air Force during 1962/1963 (passed thru Prestwick 09Nov62); its previous identities would also included 42-92627, KG414, BJ764 Indian Air Force. 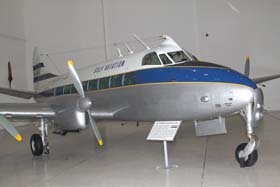 The Air-Britain book (see below) has c/n 12449 preserved at Bangalore by Jan.1994. 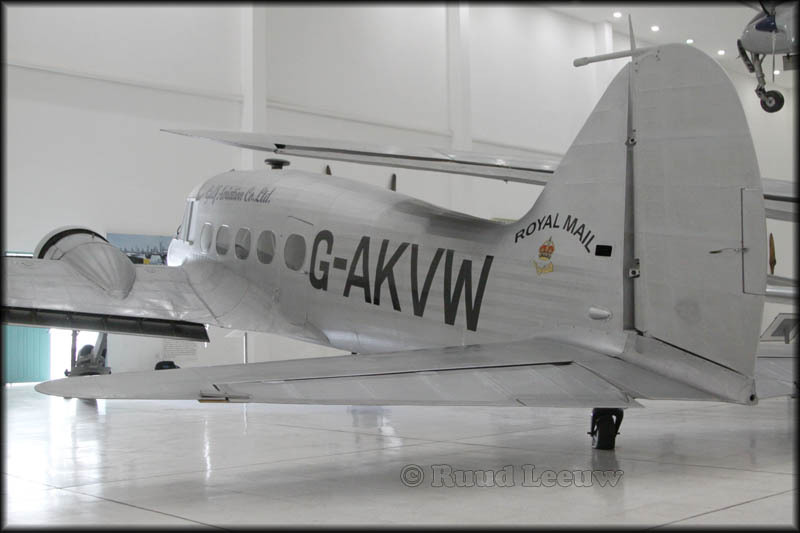 Delivered 22May45 as 42-77008, reregistered KN648 RAF Montreal 23May45, UK 20May45 - 24 Sqdn 20Aug45 - 22 MU 24Nov49. 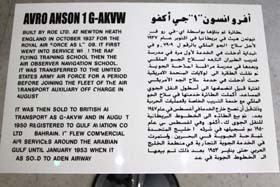 Registered G-AMZZ for Aviation Servicing Ltd 08Jun53, to Eagle Aircraft Services (named "Lord Hood") regd'd 05Aug53 and to Kuwait National Airways Ltd reg'd 09Mar54. 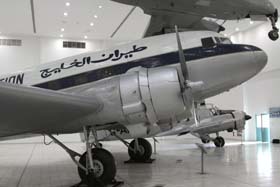 The airline's name changed to Kuwait Airways in july 1955. 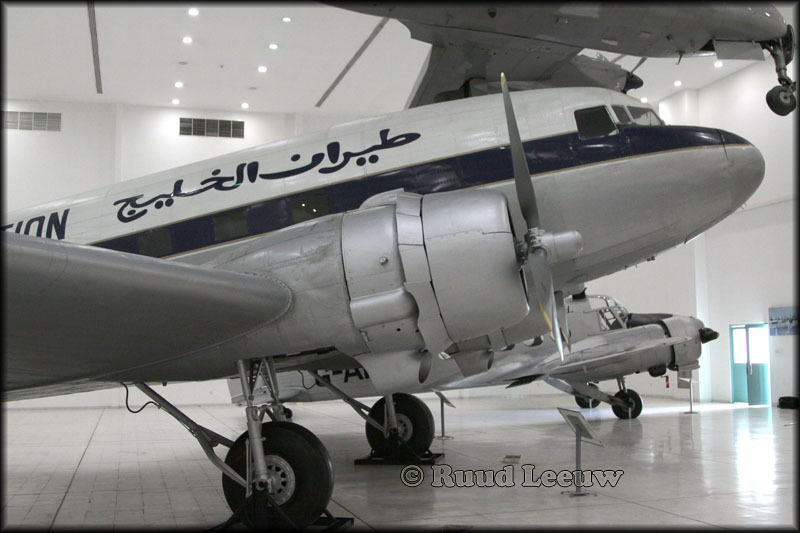 The regisrtation was changed to EP-ABD for Iranian Airways Co. Ltd in Nov59. 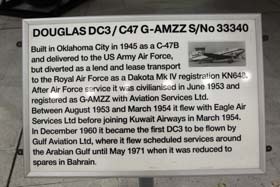 And changed back again to G-AMZZ for Gulf Aviation Ltd (named "Kazemah") upon its purchase on 23Nov60. 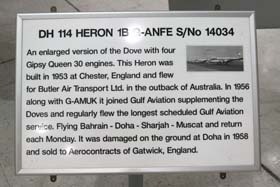 It was deemed 'without further use' on 26May71 and reported derelict at Bahrain in Oct78. 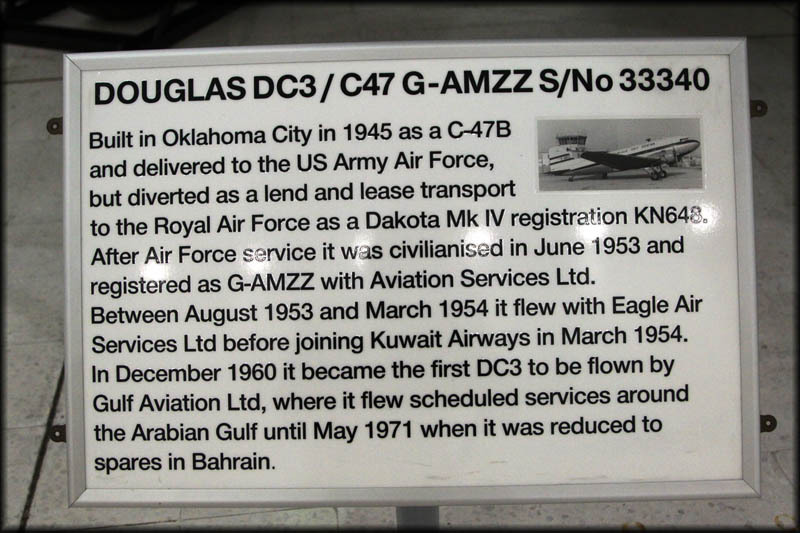 This book also notes here that 'G-AMZZ' preserved in Kuwait is c/n 25806. 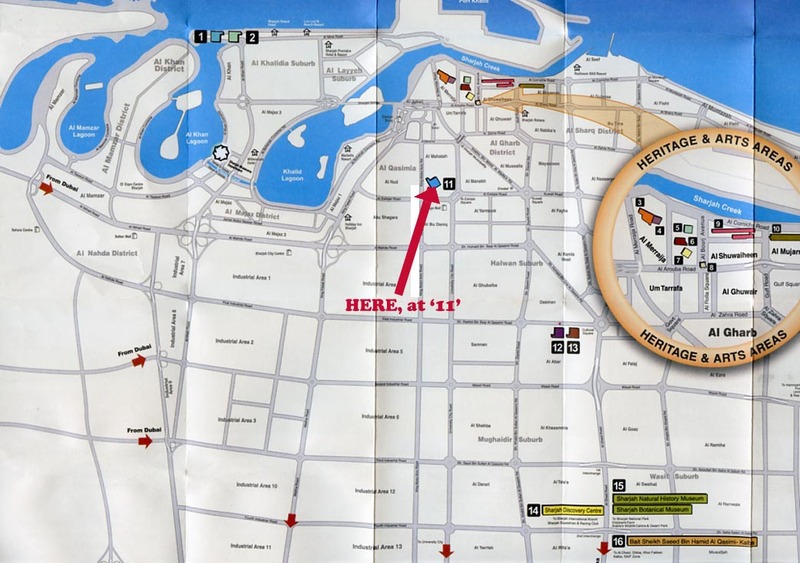 And note: the book does not include its present location! 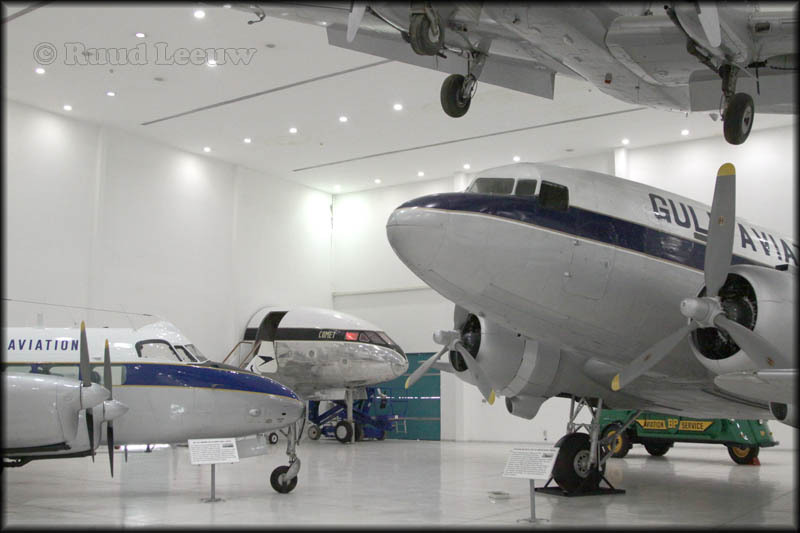 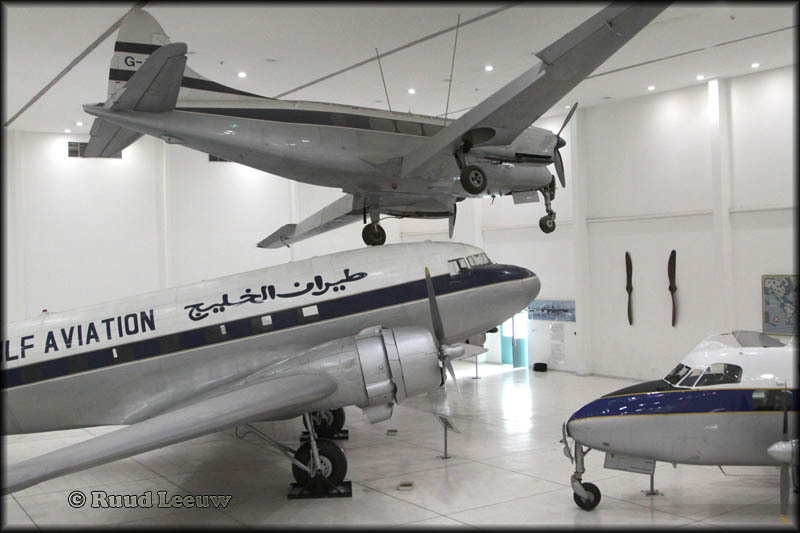 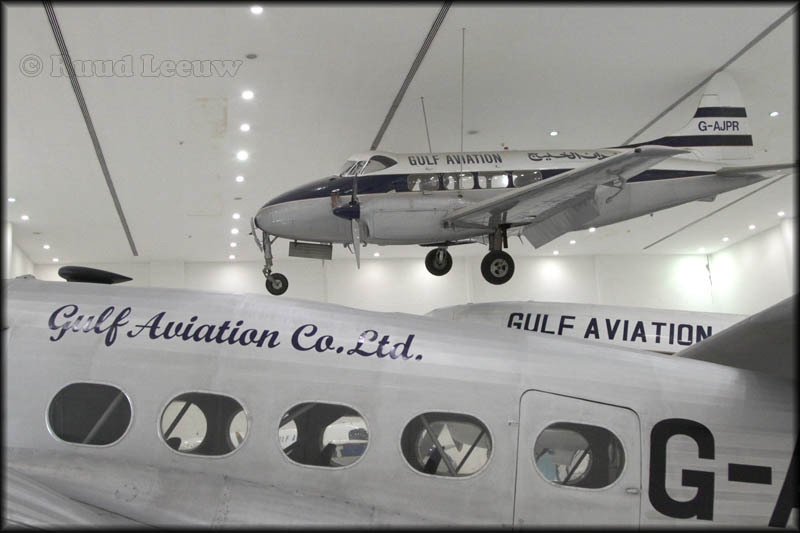 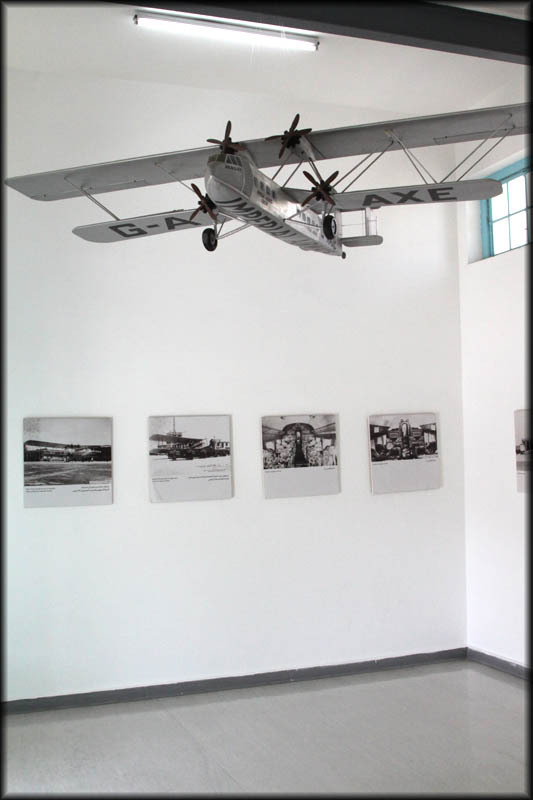 Bob Ogden's excellent book Aviation Museums & Collections of the Rest of the World (3 books covering this subject all over the world) and published in 2008, has this museum 'Al Mahatta Museum', located in Bahrain... More precise, "in the western suburbs of the city". 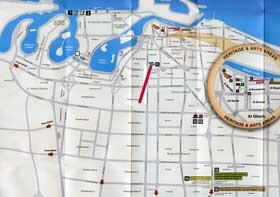 It seems to have relocated, obviously! 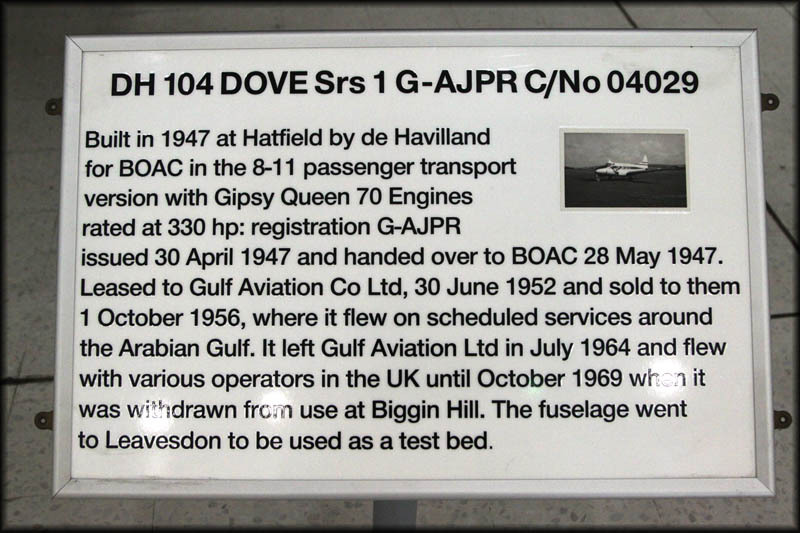 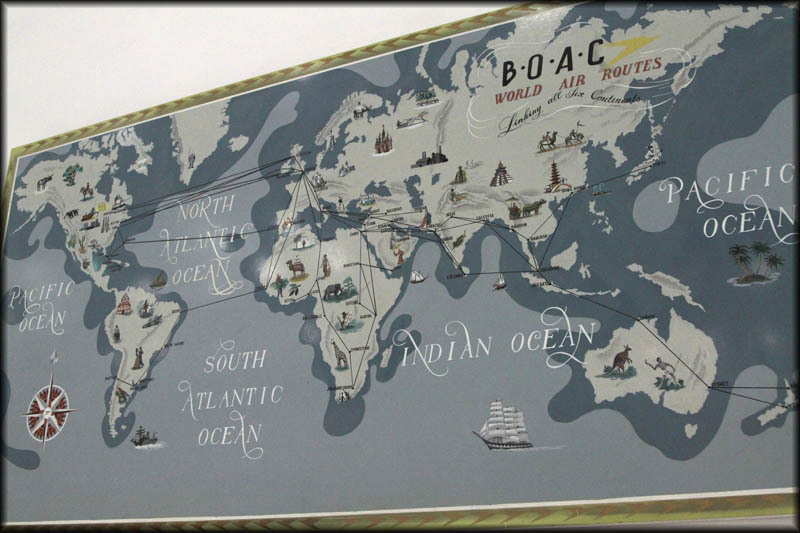 As one can see, Mr Ogden lists the DC-3 as c/n 12254. C/n 12254 delivered 31Jan44 as 42-92452, reregistered FZ669 to RAF Montreal 10Feb44, to 233 Sqdn UK 29Feb44 - 437 Sqdn 28Sep44 - Canadian Government 16Jun46 - RCAF Weyburn 26Aug46, type Dakota 3N - 1 ANS VCDHQ 05Aug49 - 2 ANS Winnipeg 15Jan62 - Dak 3NRO 28May70 - registration changed to 12943 for RCAF in June 1970, 429 Comp. 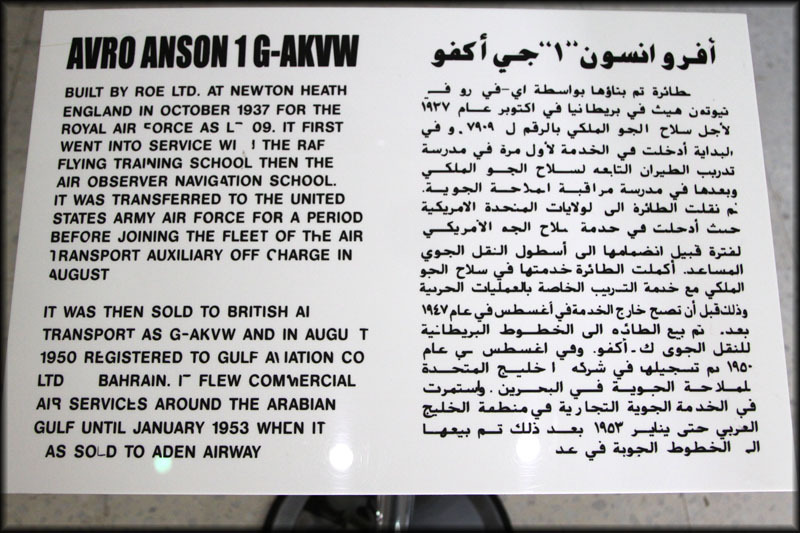 Sqdn Winnipeg 02Mar72 - AUDU Saskatoon 24Jan75. 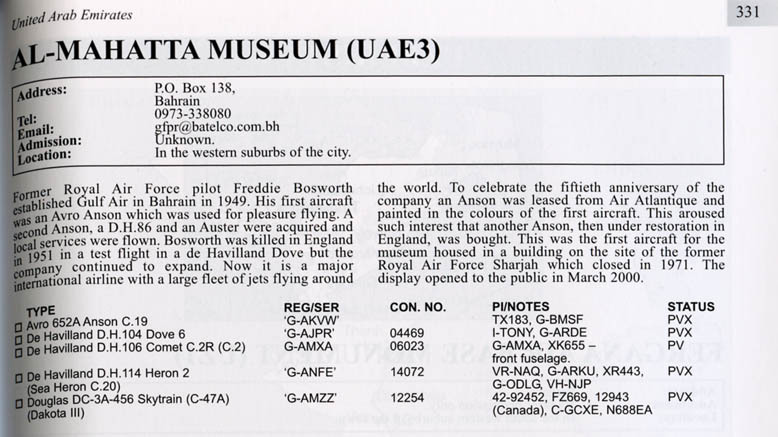 Registration revised to C-GCXE for Aero Trades Western Ltd, Winnipeg acquired 15Aug75, reg'd 20Apr76 - and registration cancelled Nov. 1984. 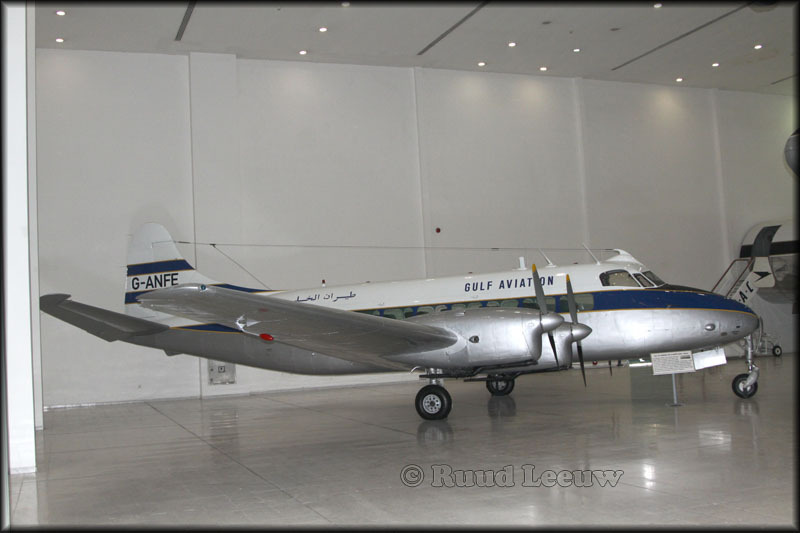 Registered as HH-CMG (1984/1985), then HI-502 for C. Guichardo in 1987 and this was cancelled on 13Mar89. 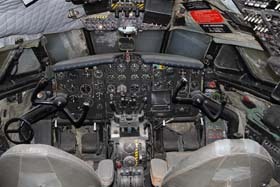 Next was Harry Delno, Sanford,FL reg'd on 17Mar89, declared 'without further use' March 1989. Then Express Airways of Sanford,FL which reg'd it on 14May92; but these past two had no N-number to their registering...? 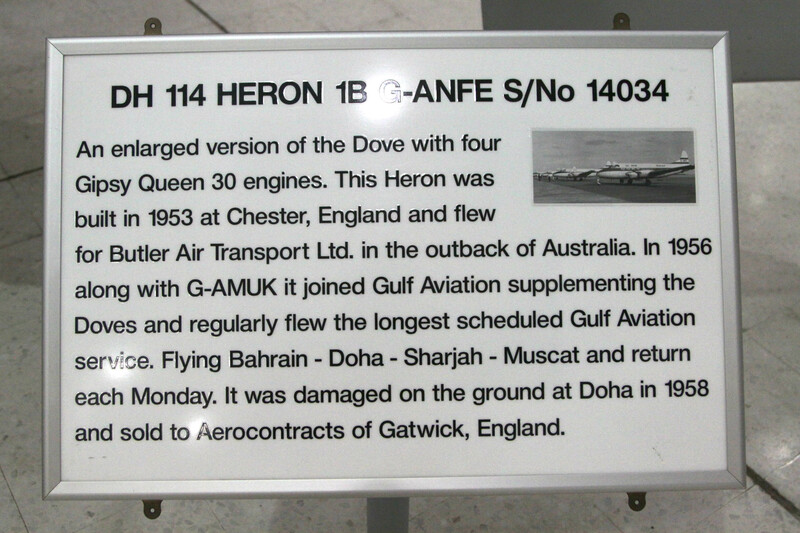 Then that same Harry Delno registered it as N688EA on 09Mar93. 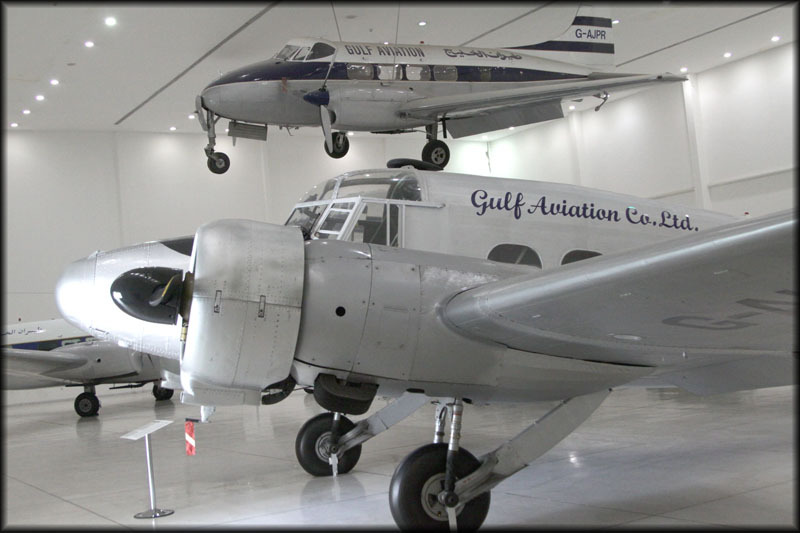 On 18Dec96 it was reg'd for Cameron & Stall Inc. of N.Hollywood,CA and N688EA was reported stored at Opa Locka (near Miami), Florida during Oct. '99. 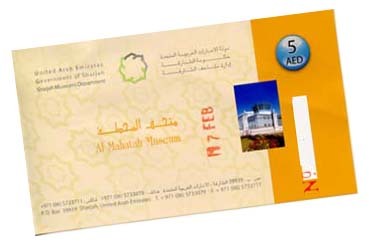 At first it was marked 'G-DJKP' for the Al Mahatta museum, then changed into 'G-AMZZ'. 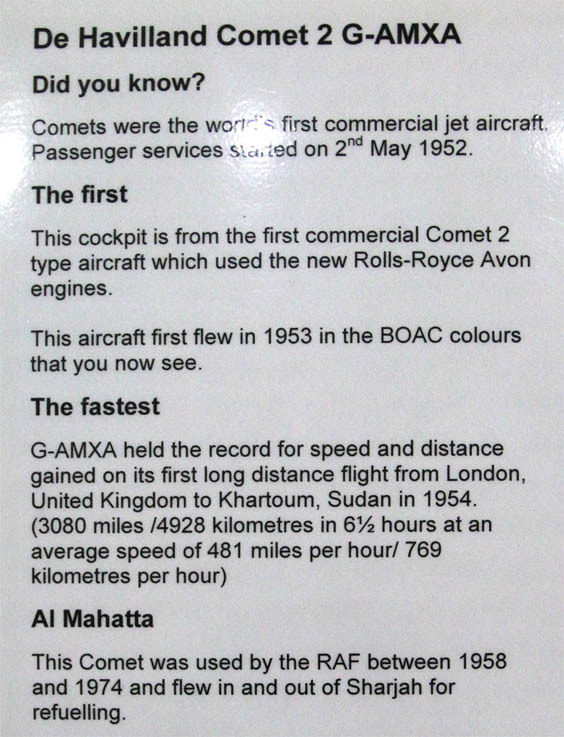 But no dates to this. 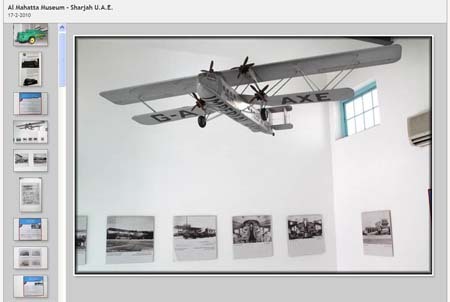 By January 2003 at the Sharjah Aviation Museum. 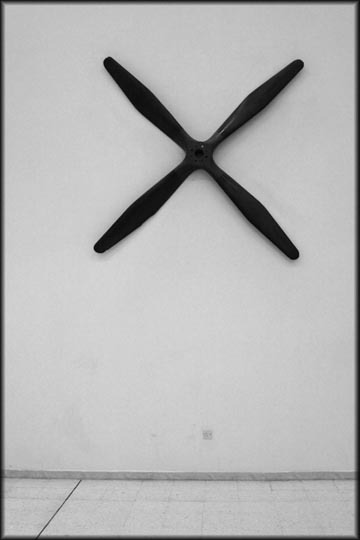 ./end quote from the book. 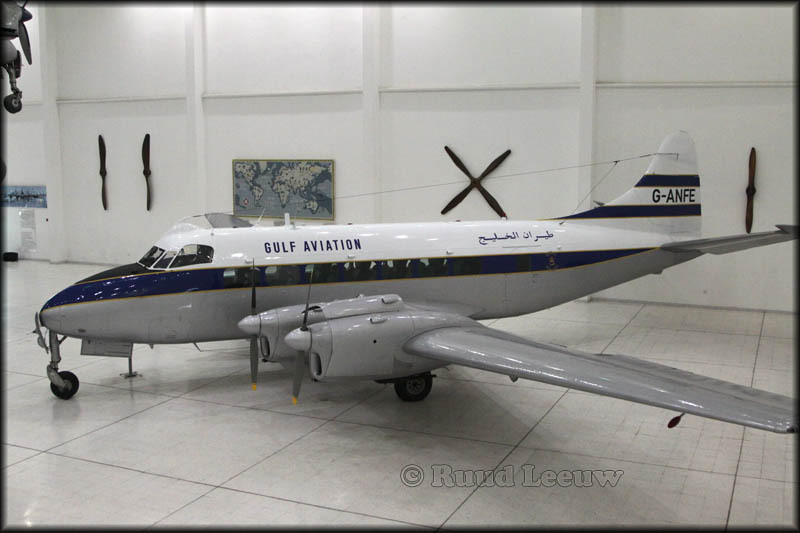 The fake G-AMZZ currently at the Al Mahatta Museum in Sharjah is ex N688EA c/n 12254 (was C-GCXE in the 1970s and 1980s). 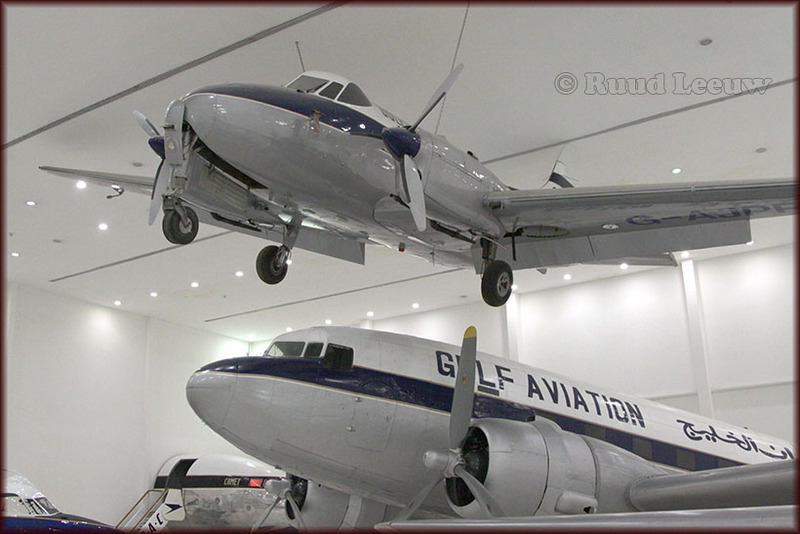 The fake G-AMZZ currently at the Kuwait Science and Natural History Museum in Kuwait City is ex N94718 (c/n 25806). 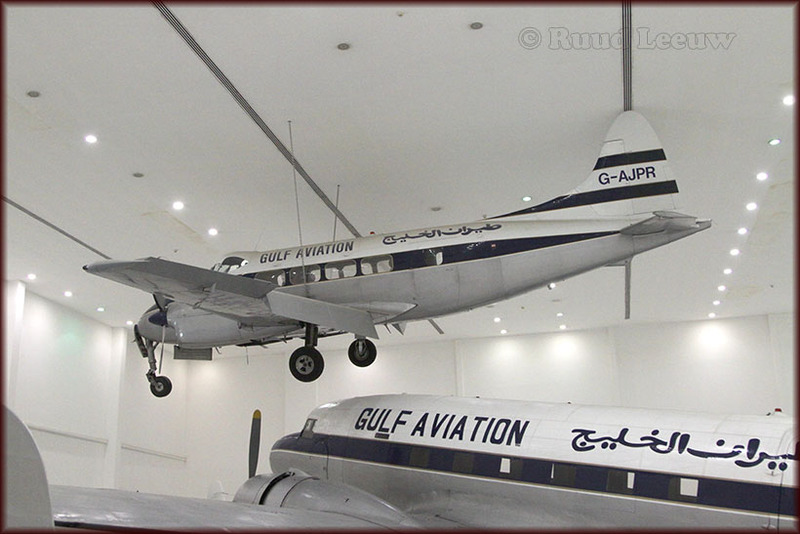 Finally, the real G-AMZZ (c/n 33340) was withdrawn from use in 1971 and stored at Muharraq, Bahrain. 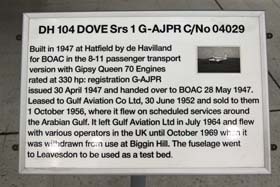 Last seen there in Oct-1978, presumed broken up not long after that."